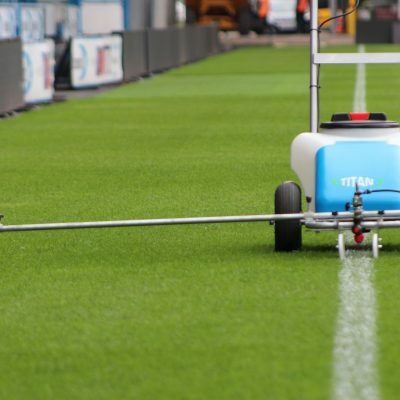 The TITAN spray line marker has been developed in consultation with professional groundsmen. 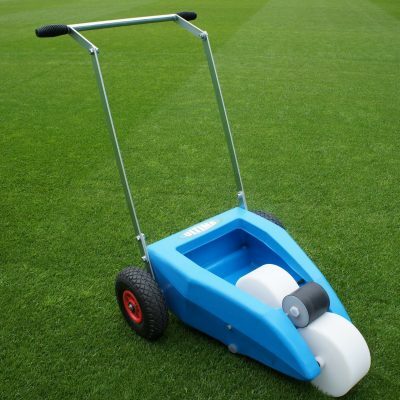 The result is a hand built, well balanced and robust, high specification spray marker that combines all the needs of the professional groundsman into a single machine and offers exceptional value for money. 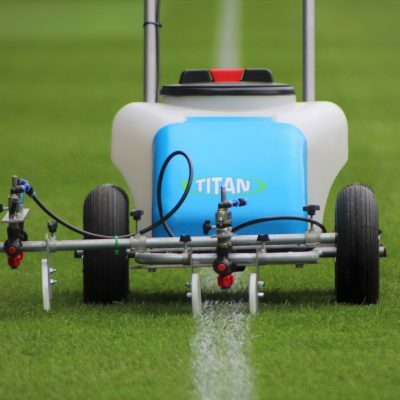 Whether its single or multi-pitch line marking, the TITAN will deliver a smooth, constant and even spray line marking performance. The battery has a long powerful life and will drive the pump for a full days marking from a single charge. The battery can be charged whilst in position or can be lifted out for charging away from the marker. An automatic battery charger is supplied as standard. 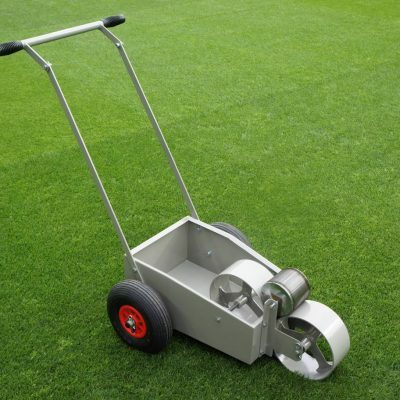 The pump is both efficient and economical and when used in conjunction with the variable pressure valve, enables the groundsman to control the volume of paint delivered to the twin spray heads for a dense professional line or a more economical line. 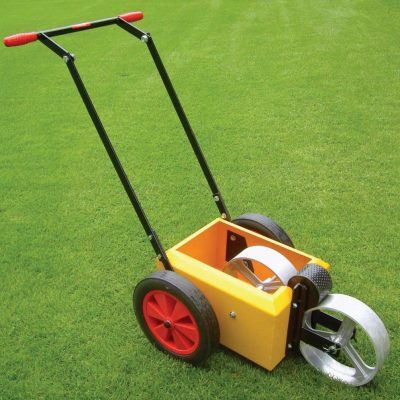 The Grassline TITAN offers a variable line width of 50mm, 75mm or 100mm (2, 3 and 4 inch). 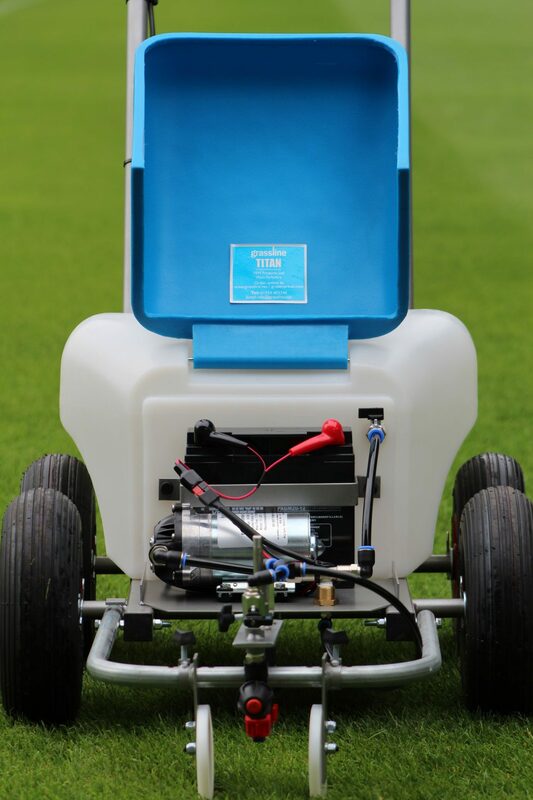 Twin Spray Heads You can choose to use a single spray delivery for economical /normal line marking or both sprays for a double spray delivery but in a single pass. Integral Mixing System The TITAN’s tank holds 30 litres of mixed marking paint and has an integral mixing system as standard. The paint concentrate should be thoroughly mixed/diluted with water in a suitable container and then poured into the tank. DO NOT MIX THE PAINT CONCENTRATE WITH WATER IN THE TITAN’S TANK. 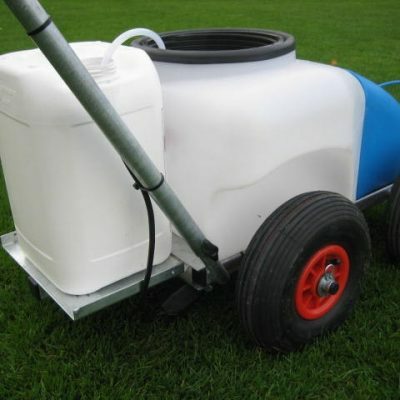 After the mixed paint has been poured into the tank, the Integrated Mixing System can be activated to continue the mixing process before spraying commences and during breaks in spraying. The system is activated by use of the pressure valve located under the hood which opens/closes the system. When activated, the paint will by pass the spray heads and flow back into the tank. The pressure valve can also be used to regulate the pump pressure and consequently the volume of paint being delivered to the spray heads. 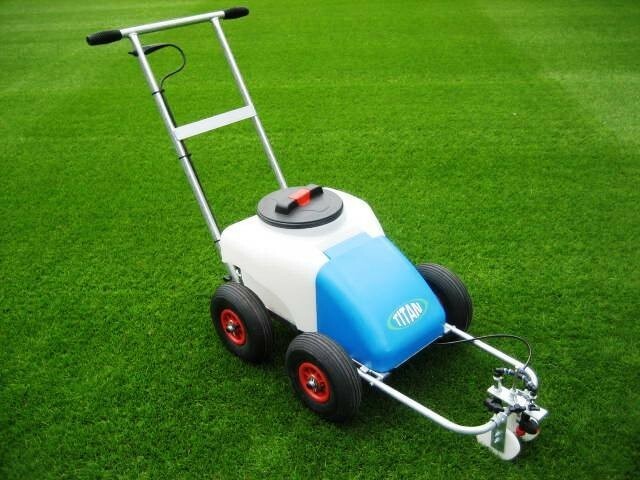 This reduced pressure enables the Titan to be used for marking hard sports surfaces, tarmac, concrete, car parks, playgrounds etc where a lesser volume of paint is needed to mark non porous surfaces. Other features supplied as standard:- Galvanised adjustable handle. Pneumatic tyres and roller bearing wheels. Heavy duty battery. Compatible battery charger. 115mm (4 and 1/4 inch) filling filter. Tank with flexible pipe and in-line weighted filter. Stainless steel spray heads with in line anti dribble valves and removable nozzles. Steel adjustable thumb screws. Plus 1 free bottle of Titan Power Clean cleaning concentrate. All prices published on the website are plus VAT. Most products include free next day delivery; however some products are excluded and the delivery price will be published accordingly. Please refer to the ‘Free Next-Day Delivery (Exclusions)’ section below. 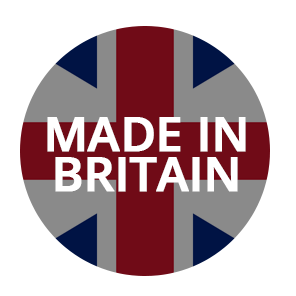 Our products could be despatched from a number of warehouses around the UK. We use a mix of parcel carriers, pallet delivery companies and Royal Mail to make our deliveries. Orders for less than 15 bottles/items (at our discretion) will be delivered by a parcel carrier. All orders received by 12 noon each day will be despatched the same day for delivery the following day in most cases. However, please note that we quote a delivery timescale of 1 to 3 working days and next day delivery should not be relied upon nor should you place your order in the belief that it will be with you the next day without fail because this may not be the case or happen. Delivery can be to your home, workplace or club but each delivery will need to be signed for unless you advise us that the delivery can be left without a signature at your risk, in which case you must tell us where the delivery can be left in safety ie leave round the back, behind the wheelie bins, in the garage, with a neighbour or wherever. If you opt for delivery without a signature being required, Grassline will not be liable for any loss or damage that may occur. The published prices are for UK mainland deliveries. 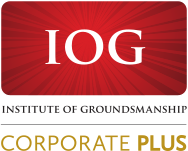 For delivery costs to the Scottish Highlands and Islands, Isle of White, Isle of Man and Northern Ireland, please contact our office. Order for 15 bottles/items or more will be despatched on a pallet for delivery by a pallet delivery company. Delivery of the pallet will be by arrangement between the customer and the pallet delivery company. All pallet deliveries will need to be signed for but can be left without a signature, at your risk, in the drive or wherever specified. Please note that there must be ample large vehicle access to the delivery address. 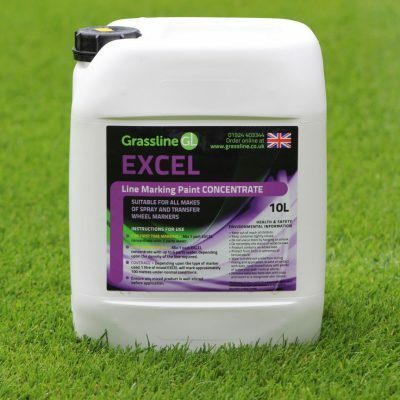 Any Grassline paint found to have a manufacturing fault will be replaced. Please note that paint should not be stored on solid floors, particularly in wintertime, as the cold may induce separation, nor should it be stored in direct sunlight. 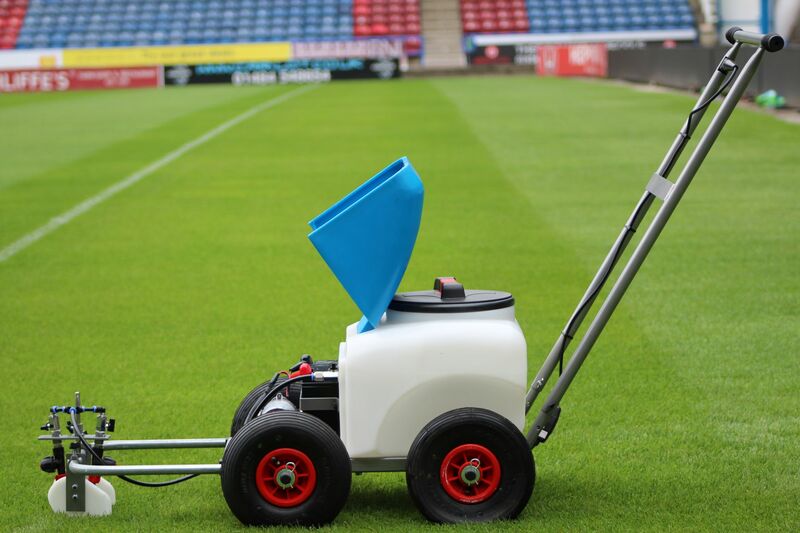 If you wish to cancel the order, please write to Grassline Sports Marking Liquids, C/O VFM Products Ltd, Ossett Lane, Earlsheaton, West Yorkshire, WF12 8LS, email to info@vfmltd.com or fax on 01924 493366 within the cooling off period. You may wish to keep a copy of your cancellation notification for your own records. If you send us your cancellation notice by e-mail or by post, then your cancellation is effective from the date you sent us the e-mail or posted the letter to us. Free next-day delivery is only applicable on orders received and paid for before 12 noon each day. Next day does not include Saturdays and Sundays or official Bank Holidays, these are NOT defined as working days. 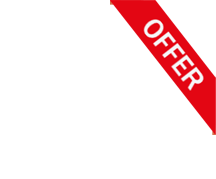 Free next-day delivery only applies to UK mainland deliveries. 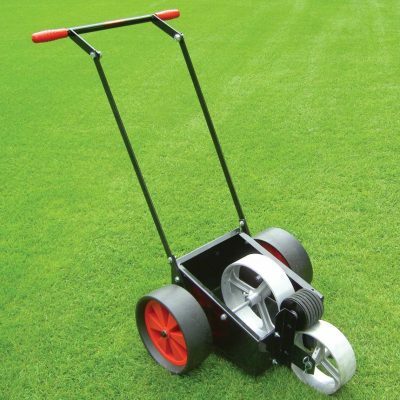 Please note the following products are excluded from free next-day delivery: Grassline Portable Tanks, The Linesman, The Prince Marker, Park Dimple Wheel Marker, Fertiliser and Grass Seed.